ELLAS MCDANIEL, ComposerLyricist - Bob Gibson, ComposerLyricist - The Black Keys, MainArtist - Prentice Polk, Jr., ComposerLyricist Auteursrecht : ℗ 2011 MPL Communications Inc. and Concord Music Group, Inc.
Fiona Apple, MainArtist - Buddy Holly, ComposerLyricist - Norman Petty, ComposerLyricist - JON BRION, MainArtist Auteursrecht : ℗ 2011 MPL Communications Inc. and Concord Music Group, Inc. Buddy Holly, ComposerLyricist - Norman Petty, ComposerLyricist - Paul Mccartney, MainArtist Auteursrecht : ℗ 2011 MPL Communications Inc. and Concord Music Group, Inc. Buddy Holly, ComposerLyricist - Norman Petty, ComposerLyricist - JOHN PORTER, Engineer, StudioPersonnel - Mike Napolitano, Mixer, StudioPersonnel - Terence Higgins, Drums, AssociatedPerformer - Florence + The Machine, MainArtist - Ivan Neville, Keyboards, AssociatedPerformer - C.C. Adcock, Producer - Florence Welch, Vocals, AssociatedPerformer - Matt Perrine, Upright Bass, AssociatedPerformer Auteursrecht : ℗ 2011 MPL Communications Inc. and Concord Music Group, Inc.
Jerry Leiber, ComposerLyricist - Mike Stoller, ComposerLyricist - Cee Lo Green, MainArtist Auteursrecht : ℗ 2011 MPL Communications Inc. and Concord Music Group, Inc. 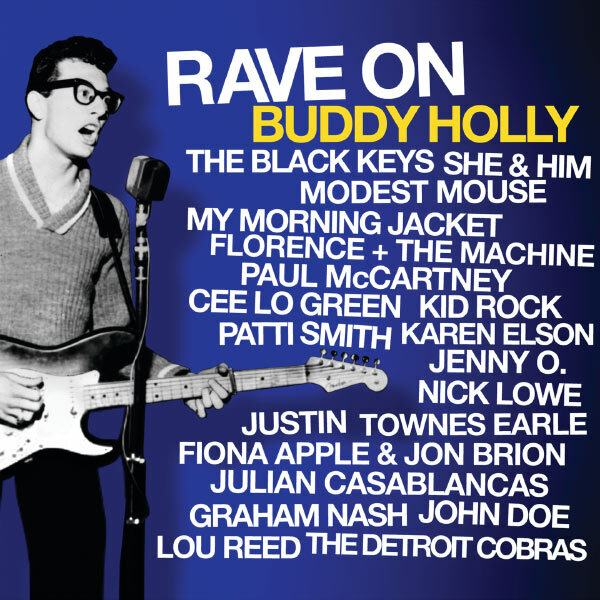 Buddy Holly, ComposerLyricist - Karen Elson, MainArtist Auteursrecht : ℗ 2011 MPL Communications Inc. and Concord Music Group, Inc.
Julian Casablancas, MainArtist - Sonny West, ComposerLyricist - Norman Petty, ComposerLyricist - Bill Tilghman, ComposerLyricist Auteursrecht : ℗ 2011 MPL Communications Inc. and Concord Music Group, Inc.
Joe Mauldin, ComposerLyricist - Norman Petty, ComposerLyricist - Jenny O., MainArtist - Niki Martin Sullivan, ComposerLyricist Auteursrecht : ℗ 2011 MPL Communications Inc. and Concord Music Group, Inc. Buddy Holly, ComposerLyricist - Justin Townes Earle, MainArtist Auteursrecht : ℗ 2011 MPL Communications Inc. and Concord Music Group, Inc.
Sonny West, ComposerLyricist - Norman Petty, ComposerLyricist - She & Him, MainArtist - Bill Tilghman, ComposerLyricist Auteursrecht : ℗ 2011 MPL Communications Inc. and Concord Music Group, Inc.
Nick Lowe, MainArtist - Buddy Holly, ComposerLyricist Auteursrecht : ℗ 2011 MPL Communications Inc. and Concord Music Group, Inc. Buddy Holly, ComposerLyricist - PATTI SMITH, MainArtist Auteursrecht : ℗ 2011 MPL Communications Inc. and Concord Music Group, Inc. Buddy Holly, ComposerLyricist - Norman Petty, ComposerLyricist - My Morning Jacket, MainArtist Auteursrecht : ℗ 2011 MPL Communications Inc. and Concord Music Group, Inc. Modest Mouse, MainArtist - Buddy Holly, ComposerLyricist - Norman Petty, ComposerLyricist - Jerry Allison, ComposerLyricist Auteursrecht : ℗ 2011 MPL Communications Inc. and Concord Music Group, Inc.
Joe Mauldin, ComposerLyricist - Buddy Holly, ComposerLyricist - Norman Petty, ComposerLyricist - Jerry Allison, ComposerLyricist - Kid Rock, MainArtist Auteursrecht : ℗ 2011 MPL Communications Inc. and Concord Music Group, Inc.
Norman Petty, ComposerLyricist - Bob Montgomery, ComposerLyricist - The Detroit Cobras, MainArtist Auteursrecht : ℗ 2011 MPL Communications Inc. and Concord Music Group, Inc. Buddy Holly, ComposerLyricist - Norman Petty, ComposerLyricist - Lou Reed, MainArtist - Jerry Allison, ComposerLyricist Auteursrecht : ℗ 2011 MPL Communications Inc. and Concord Music Group, Inc.
JOHN DOE, MainArtist - Buddy Holly, ComposerLyricist Auteursrecht : ℗ 2011 MPL Communications Inc. and Concord Music Group, Inc.
Felice Bryant, ComposerLyricist - Boudleaux Bryant, ComposerLyricist - Graham nash, MainArtist Auteursrecht : ℗ 2011 MPL Communications Inc. and Concord Music Group, Inc.
© © 2011 MPL Communications Inc. and Concord Music Group, Inc. This Compilation ℗ 2011 MPL Communications Inc. and Concord Music Group, Inc.